MDC Alliance president Nelson Chamisa says the Zimbabwe Electoral Commission’s (Zec) declaration of President Emmerson Mnangagwa as winner of Monday’s presidential election was a “coup against the people”. 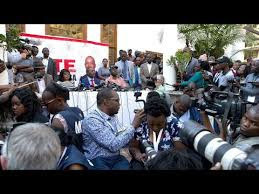 Chamisa told a Press briefing in Harare yesterday that he had overwhelming evidence to overturn Mnangagwa’s slim victory. Zec yesterday pronounced that Mnangagwa won by 50,8%, just scrapping through the constitutional threshold of 50% plus one vote to avoid a run-off. “As far as we are concerned, the presidential result is fraudulent, illegal, illegitimate and characterised by serious credibility and legitimacy issues,” he said. He would, however, not say when his lawyers would file papers to seek a reversal of the poll result. “The will of the people is not in the declaration by [Zec chairperson Justice Priscilla] Chigumba or by Zec but at the polling station where the people voted. That is what we are going to honour. We will not honour something that is null and void. “We will seek to negate and nullify that illegality for what it is. We will pursue all the necessary measures to be able to do that. The bar of an acceptable election result will not be lowered just to accommodate the expediencies that have nothing to do with honouring the people in terms of their will. Acceptance of an election result is a function of the integrity of the result and the transparency of the process,” Chamisa said. The MDC Alliance leader said he would be in contact with South African leader and Sadc chairperson Cyril Ramaphosa to seek his intervention to resolve the crisis. “We have the majority and are challenging the election. We want to reach an amicable conclusion to this problem,” Chamisa said. He claimed key State institutions were supporting the “will of the people”. “Don’t be misled by a few who may be supporting a few. They are actually divided among themselves. This government can no longer hold. There are rogue elements who want to see blood on the streets, but others who are well meaning. That is the tragedy we have,” Chamisa said, seemingly claiming sections of State institutions were now under his command. The MDC Alliance leader said Zimbabwe was now at a crossroads as was the case in 2008 after another disputed election. “We are disappointed in some reports that this election was free and fair. We have a very serious challenge in the country. We are facing a divided nation, a betrayed people and a brutalised nation. Declaration of Mr Mnangagwa as having won the 2018 presidential election is a regrettable decision. I must say Mnangagwa did not win this election. The election was won by the MDC Alliance candidate,” Chamisa said. Chamisa urged Mnangagwa to reject Zec’s coronation. “We want to advise Mr Mnangagwa that if he is a new democrat let him honour his pledge for a free and fair election and reject accepting the result that is not in his favour. He known the result, he lost the election, he must accept to give way to the new order. He must allow this young man to do the job that I was elected by the people to do.